Hubert Dews was more often known as Herbert Dews and was born in Horbury in 1884, the son of John Henry Dews and his wife Mary Amelia (nee Howson) who were married in 1878 at Ossett. Ernest's father, John Henry died in 1905 at the age of 48, leaving his wife Mary with four children to bring up. In 1911, the Dews family are living at 15, Park Street, Park Square, Ossett. The head of household is Mary Amelia Dews with three other children: Sarah Ann, Gertrude and his younger brother Ernest Dews, who also died during WW1. Hubert was a basket maker, most probably working at Burdekin's at Flushdyke, Ossett and after enlisting earlier in late 1914 or early 1915, he embarked for Egypt on the 22nd December 1915 where he saw service before being transferred to the Western Front. The battalion's history dates from 5th September 1914 when the War Office authorised the West Yorkshire Coalowners Association to raise a Miners Battalion for the King's Own (Yorkshire Light Infantry). After beginning its life at Leeds, the battalion trained first at Farnley Park, Otley and then at Burton Leonard, near Ripon. By this time it had been allocated to 31st Division as its pioneer battalion. At zero hour (7:30am) on Saturday, July 1st 1916, whistles blew all along the British line to signal the beginning of the Somme offensive. 60,000 men, the first wave of the attack rose ungainly from their starting points and began to walk out into no-man’s land. 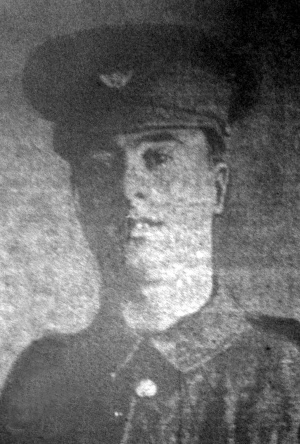 Private Herbert Dews was killed in action on the 1st of July 1916, aged 23 years, in the attack on the village of Serre, carried out by the Army 31st Division, of which the 12th Battalion, KOYLI was an important part. The failure of 31st Division's attack at Serre in the face of overwhelming enemy artillery and machine gun fire is well-known. 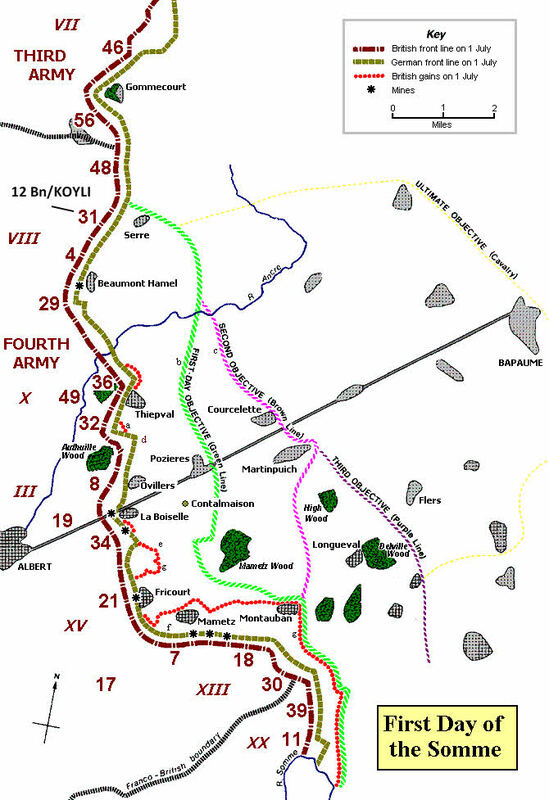 On the 94th Brigade front, two platoons from "A" Company of the 12th K.O.Y.L.I. followed the 12th York & Lancasters (Sheffield City Battalion) and 11th East Lancashires (Accrington Pals) into the attack; as many as four out of every five men from these two KOYLI platoons were wounded or killed. "I found in the front line, a good many of the 15th W. Yorks, what was left of the D.L.I. Co. attached to us, also a few of the K.O.Y.L.I." "had to rebuild trenches that were crumbling under heavy gunfire, forward supplies of ammunition, dig new trenches, and help in the later hours to save some of the wounded." The pioneers reassembled at their assembly posts at 4.30 in the afternoon. 197 officers and men were reported as killed, wounded or missing, though the return of eight missing men on 4th July 1916 brought the number of casualties down to 189. Herbert Dews’s army service record has not survived, but it is known that he enlisted at Dewsbury, and that he embarked for Egypt on 22nd December 1915, thereby qualifying for the 1914/15 Star medal, awarded for overseas service before the 31st December 1915. He was posthumously awarded this medal and the British and Victory medals for his WW1 service. Herbert Dews is buried at Railway Hollow Cemetery,2 Hebuterne, Pas de Calais France, grave reference C.6. Railway Hollow Cemetery is in the British support line of July 1916, about 1,100 metres west of Serre and 200 metres west of the plantation called "Mark Copse." It was made by the V Corps (as V Corps Cemetery No.3) when the Somme battlefields were cleared in 1917, and contains the graves of soldiers of the 3rd, 19th and 31st Divisions who died on 1 July and 13 November 1916, and 5 February 1917. The cemetery contains 107 Commonwealth burials of the First World War, 44 of which are unidentified. There are also two French war graves.